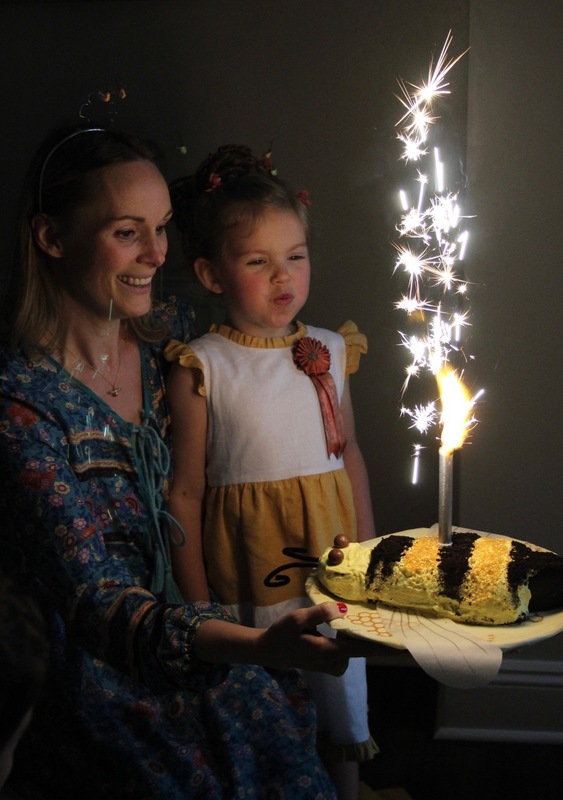 Our little Queen Bee, Beatrice, just turned five and we had a very small party in our little hive to celebrate. 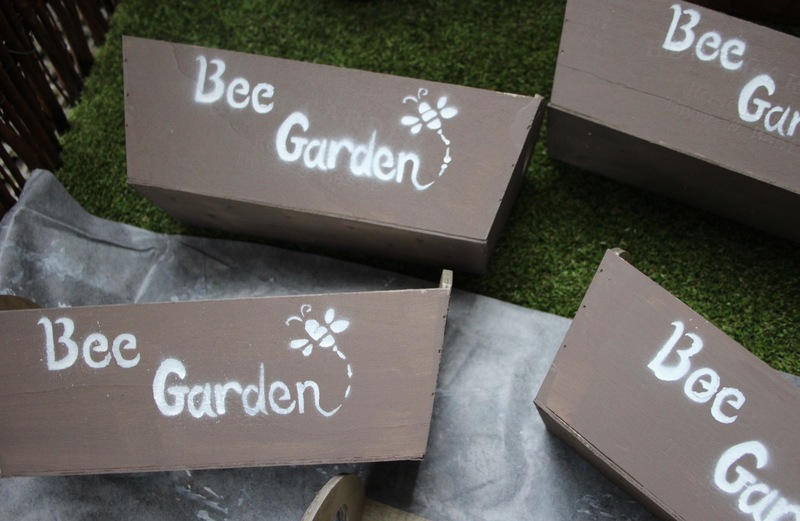 We asked a few of her closest honeybees to join us, and splashed out on homemade fun for the event. 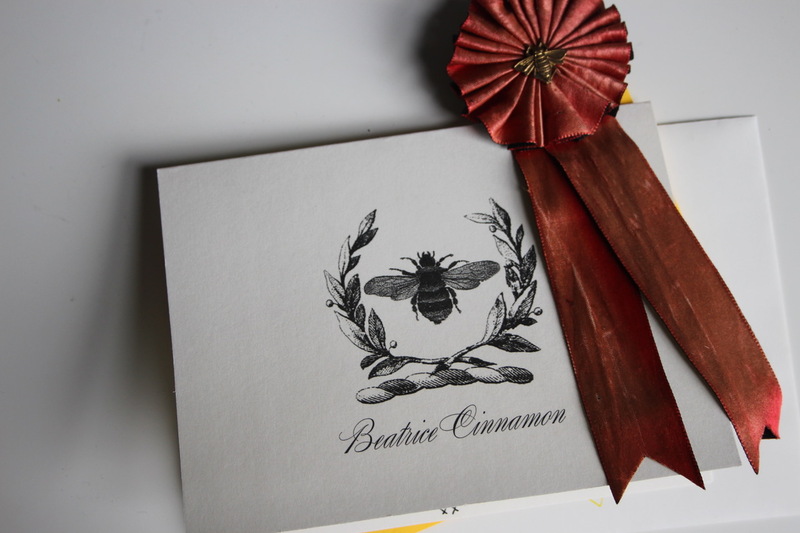 I started the preparations the week before the party, sending little personal invites out. Then I ordered a few supplies, and organised a few games. 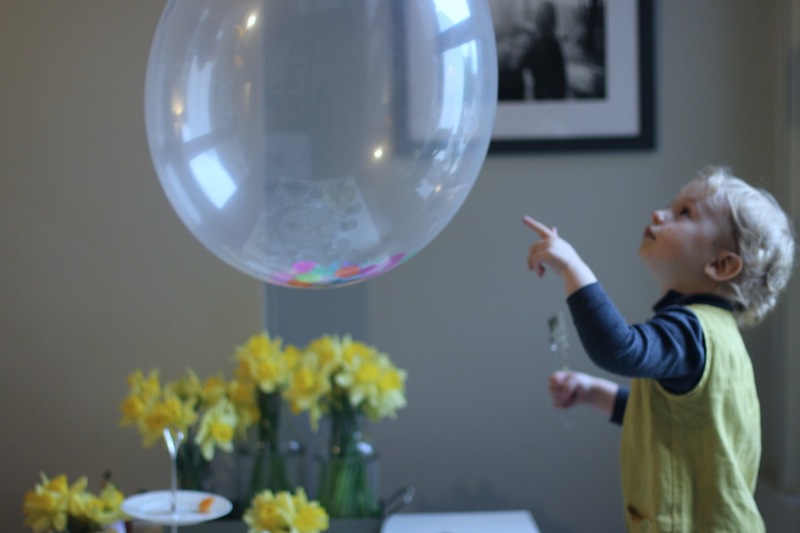 The party was so fun that I wanted to share some photos of our pre-party prep too! Side note: I used to think themed parties were so super cute but somehow more time intensive or restrictive. However, it was the opposite! 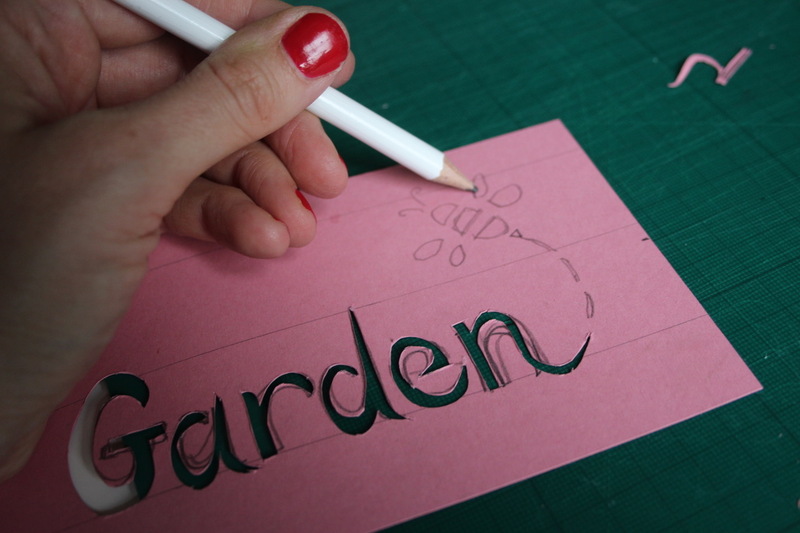 A theme gave me focus while working during the day… do you agree? I loved getting into the detail, and doing a few little things every day. Bite sized prep. Yes! 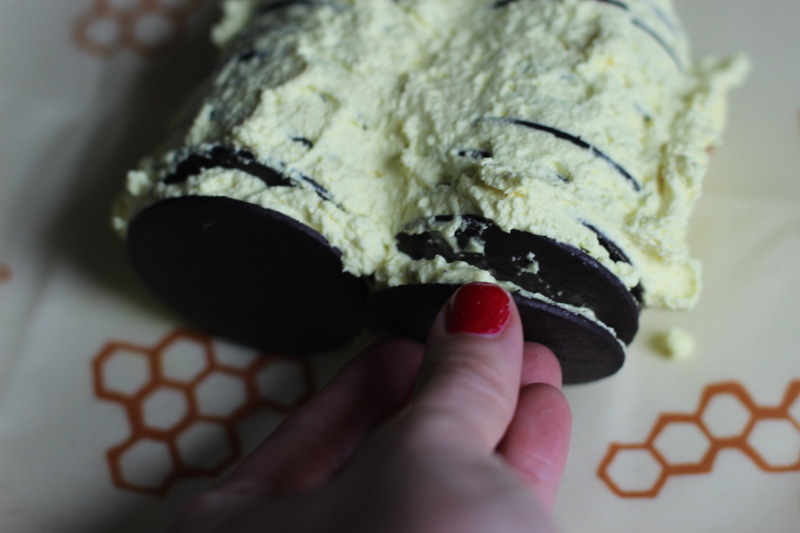 Party favours : Interesting and slightly unconventional party favours (see the tins I used before) make me happy, and I was excited to do something that the children could use. Since we only had a handful of kids — 5 kids for a 5th birthday, I didn’t have a lot of quantity, so I went for more quality. 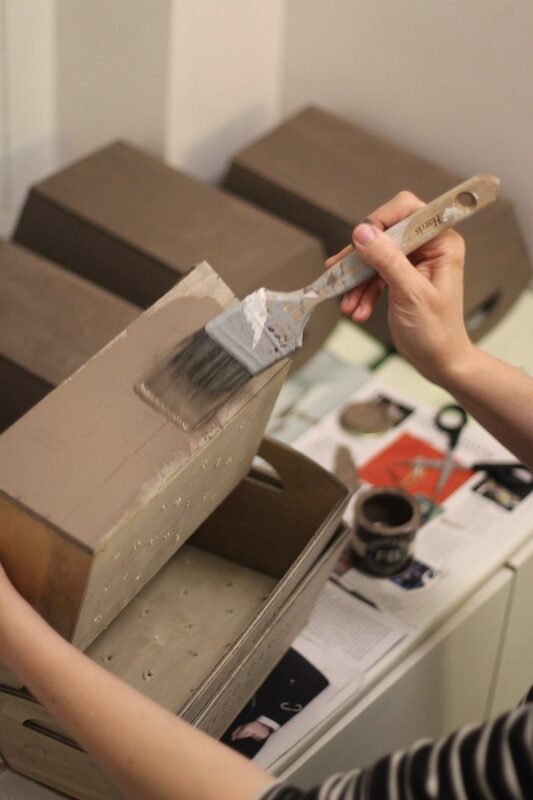 The pound store, (dollars store) came in handy, I found wooden window boxes, which I repainted with leftover house paint. 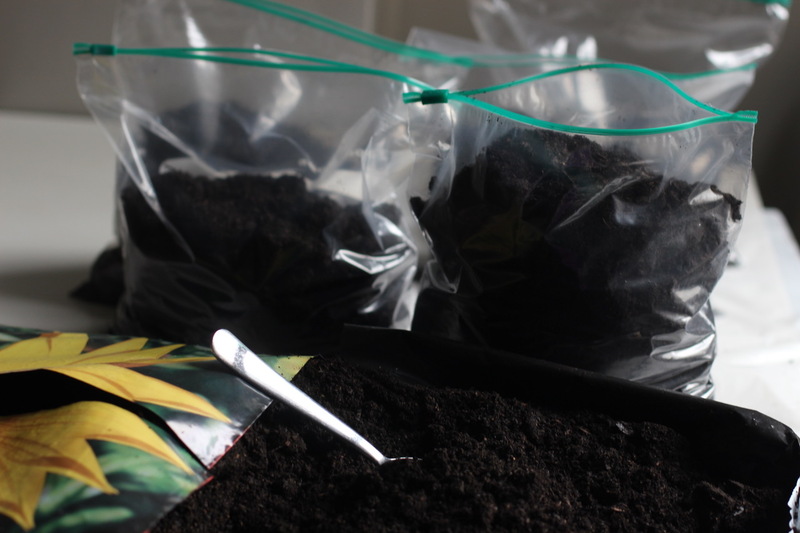 I then drilled a few holes for drainage, added a bag of compost to each, and found these lovely bee-friendly flower seeds. 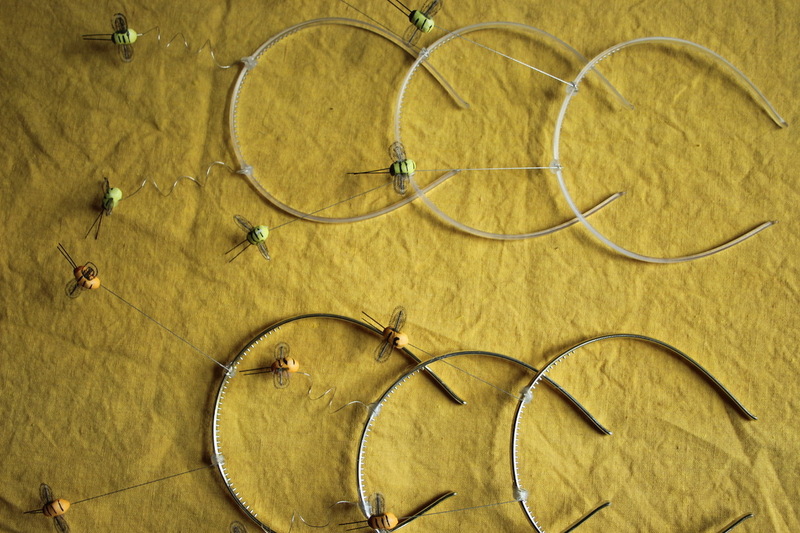 Party hats : Instead of party hats, I made simple headbands with bee antennas. 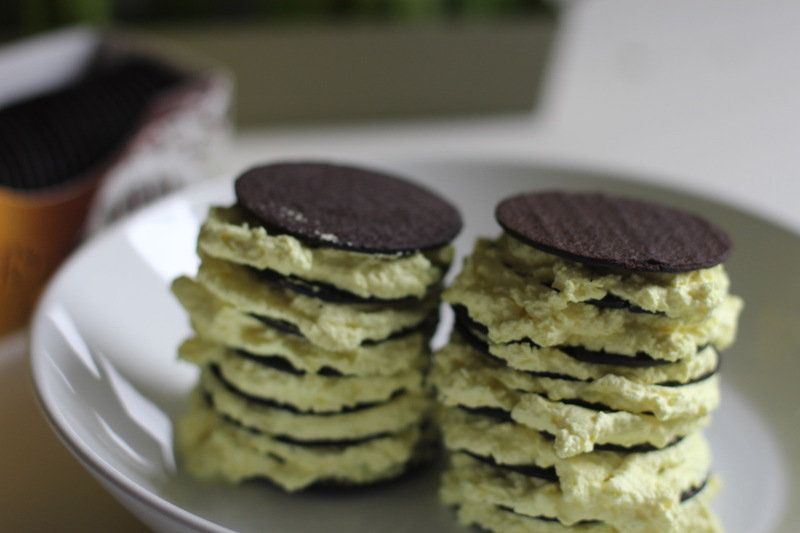 They cost about £4 to make for 9 of them, and were a big hit, bouncing about as they buzzed around. 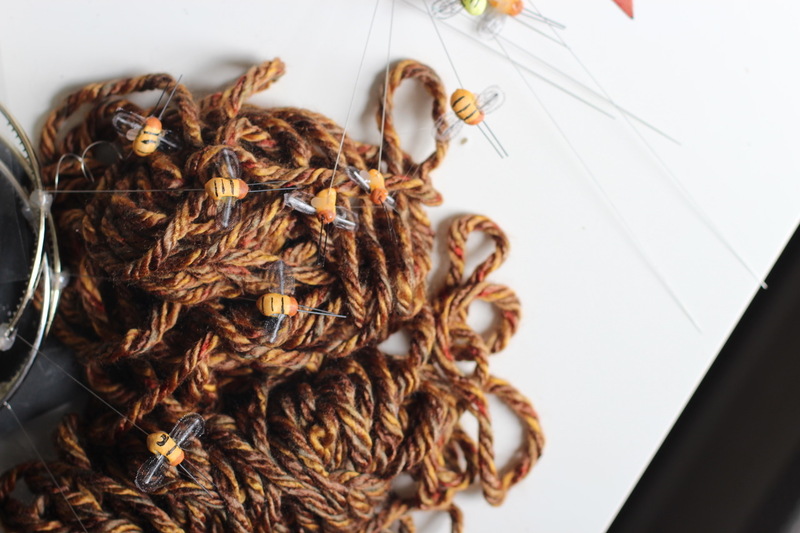 Headbands from the pound store, craft bees (similar to these). I spiralled the wire around a pencil, and a used a dab of hot glue to attach it. Each child was asked to wear a yellow, black, white, grey, or a floral outfit but this was the icing on the cake accessory! And they can wear them again too, which I love. For Beatrice, I made a haphazard beehive. Although my brief was not that it was suppose to be haphazard! 🙂 I repurposed some dark wool, used clear ponytail holders and bobby pins, and attached it to her hair, with a few vintage flowers and some of the bees — of course! She loved having a special do. Games and crafts : My husband was the Master of Ceremony and organised games with small prizes. Here are a few that were hits! 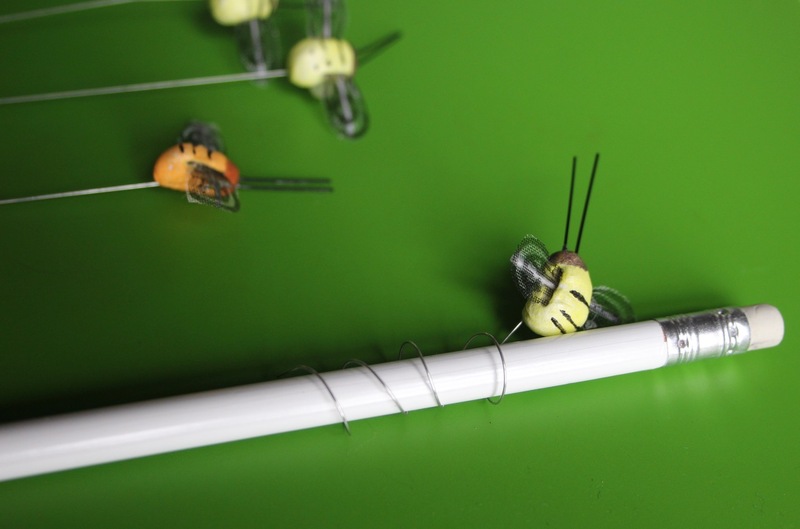 Pin the stinger on the bee — i.e. Pin the tail on the donkey. 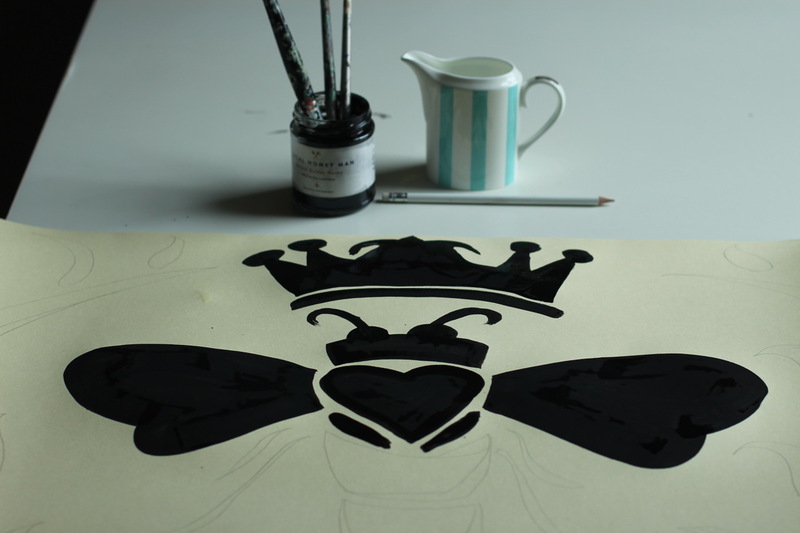 I used ink to paint a bee motif, then outlined where the stinger should be. 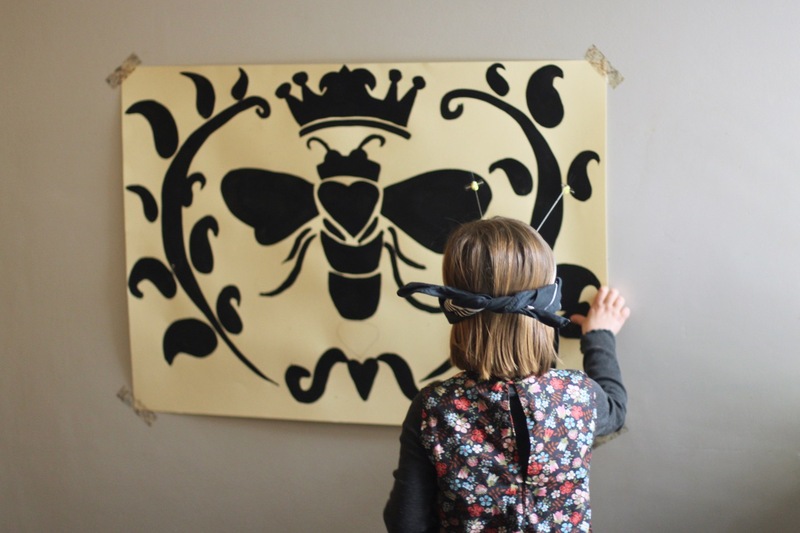 Each child had their own stinger and buzzed while being blindfolded and ‘spun around’ … it was so fun. 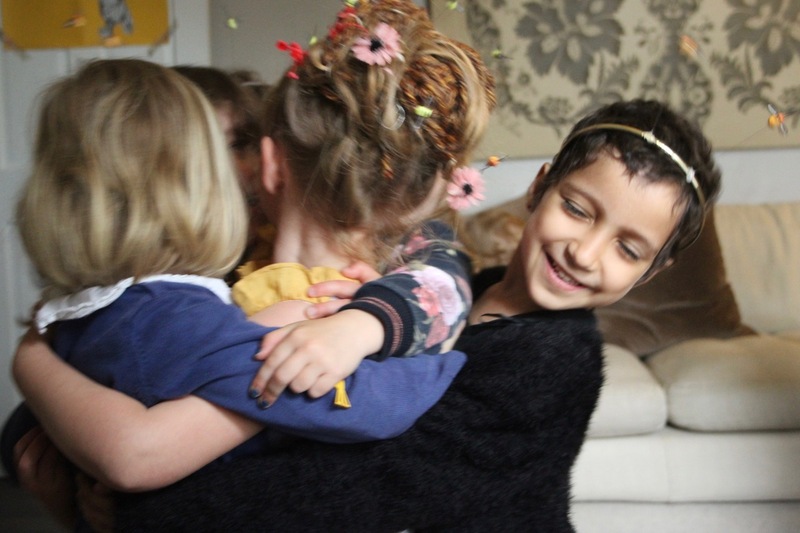 Musical statues with honey and bee songs — before the party we lined up some music with the words bee and honey and came up with such cute songs… then the dancing began! They looked sweet bouncing around in their bee head bands! 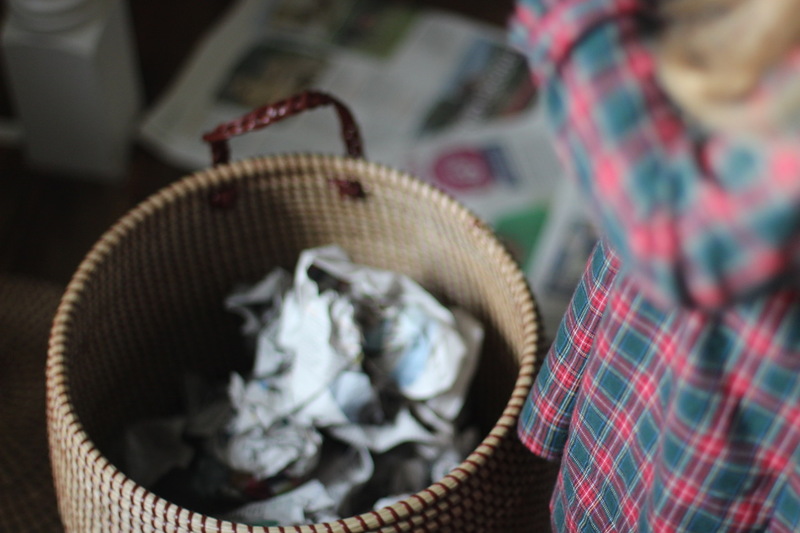 Find the bee in the Beehive — we used our laundry hamper, (convincingly like a beehive, ours is the bigger version), then scrunched up recycled newspaper and put some wooden toy bees into the beehive. 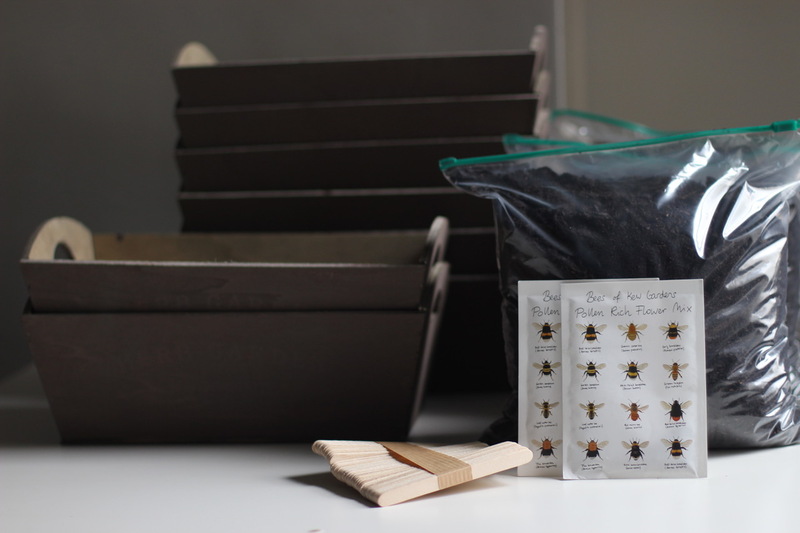 They had to count to ten, and without looking search with their hands for the bees. It was a fun game! Beeswax Candlemaking — so super simple, and a fun thing to slow everyone down a bit after buzzing about and eating tonnes of scones! (Notice Joseph’s candle is very ‘sculptural’). 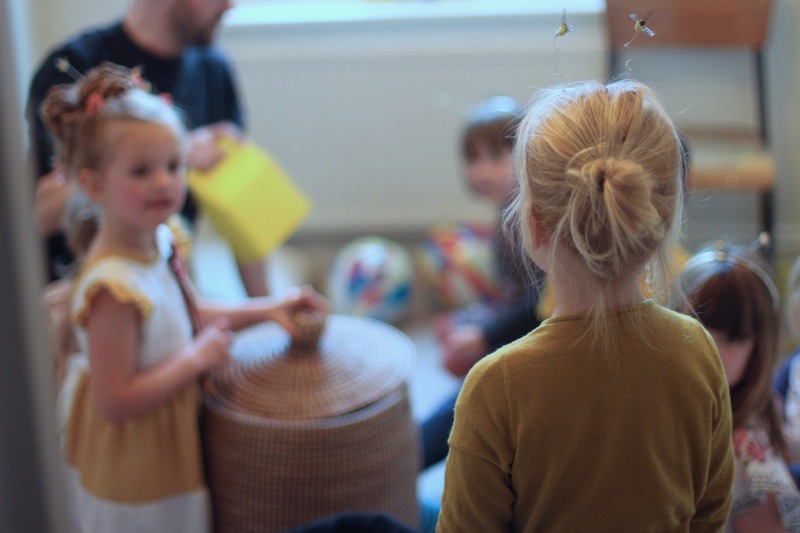 Pass the Parcel — of course! 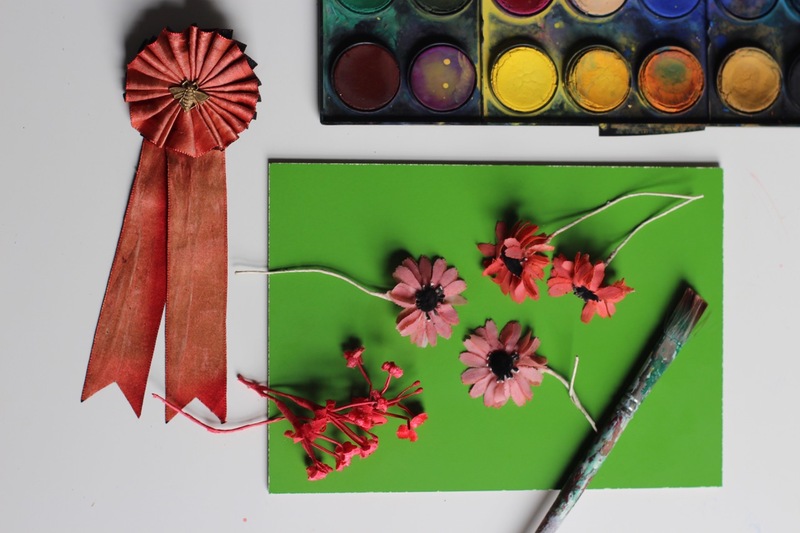 We kept it theme based with a mini Flower Press as the winning prize. 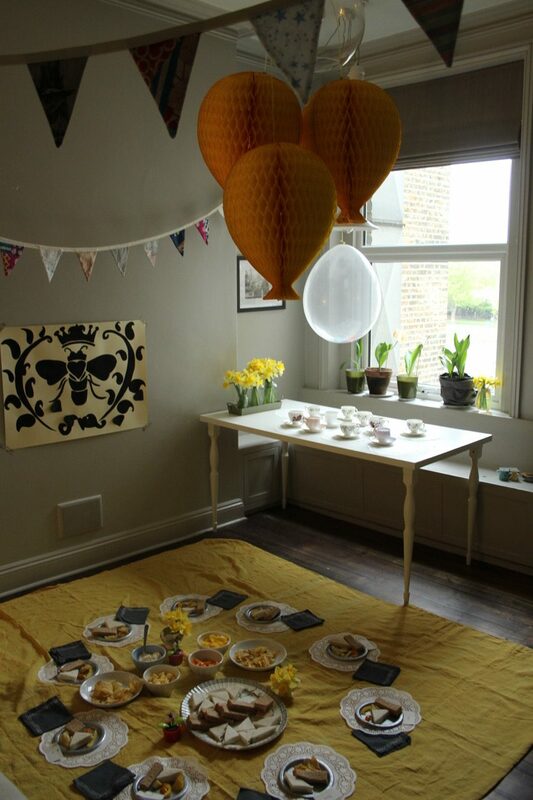 Food : With a nod to an English tea party, but a casual take on it for a 5th birthday, we set the food on a bright yellow blanket on the floor picnic style. We added big white doilies as placemats, place cards, etc. 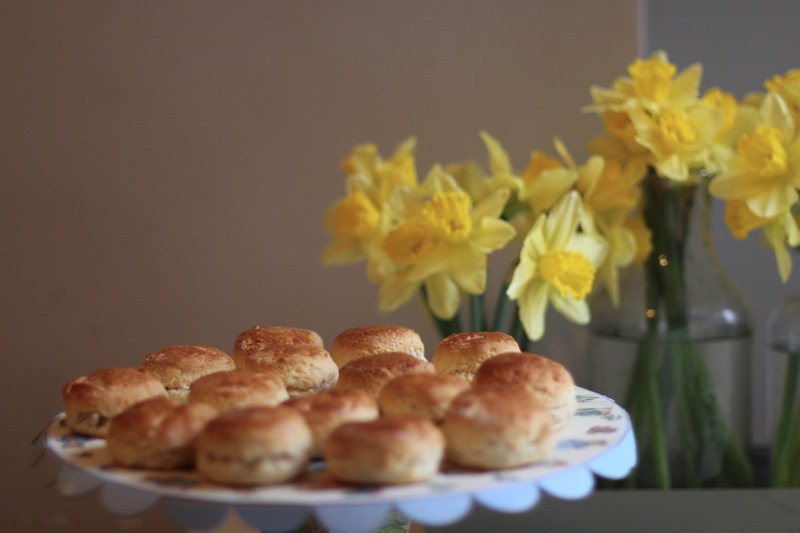 Then we had the infamous tea party courses of finger sandwiches, fresh bumblebee striped fruit, and warm homemade scones with clotted cream and jam… and cake! Yellow was the colour of choice! 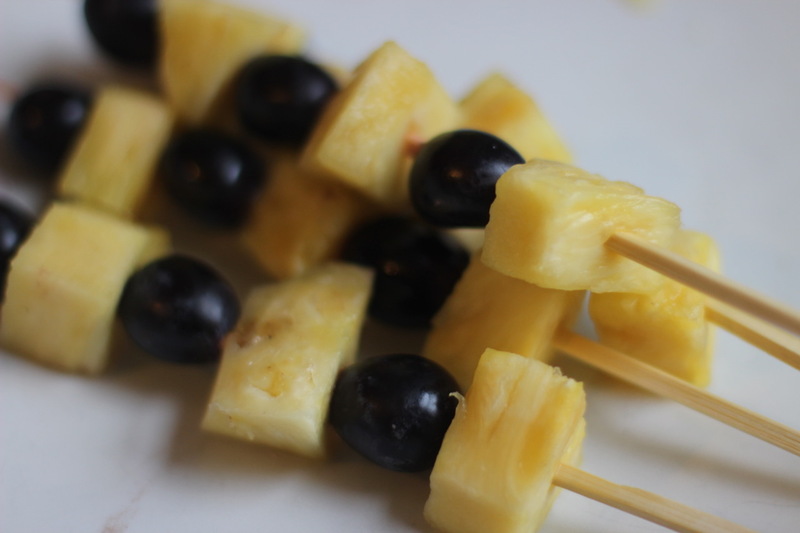 Yellow peppers and tomatoes with hummus, finger sandwiches, crisps (of course), and yellow and black bumblebee fruit skewers — pineapple and black grapes! Fun and easy. 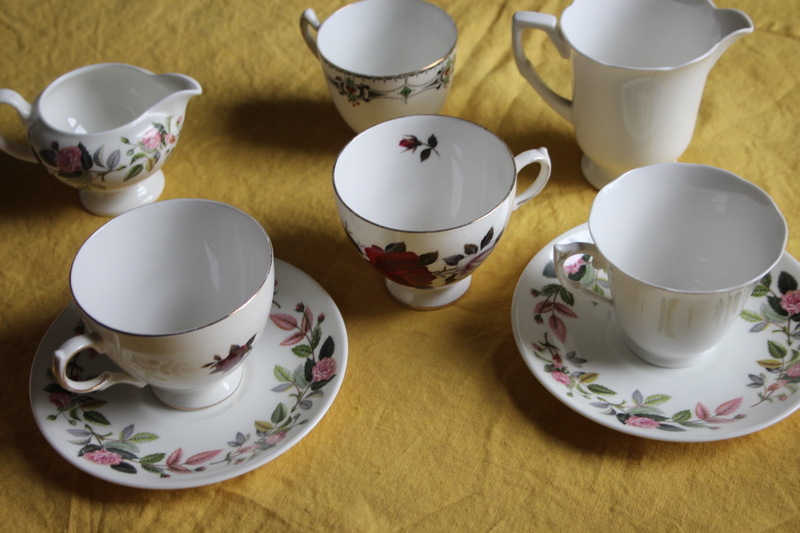 We also had a berry fruit tea which looked perfect with our borrowed tea set from a the lovely Rebecca of Babyccino too! I added white parchment paper wings with a permanent black marker to make wing marks. I then used a black felt covered wire and some chocolate ball eyes. 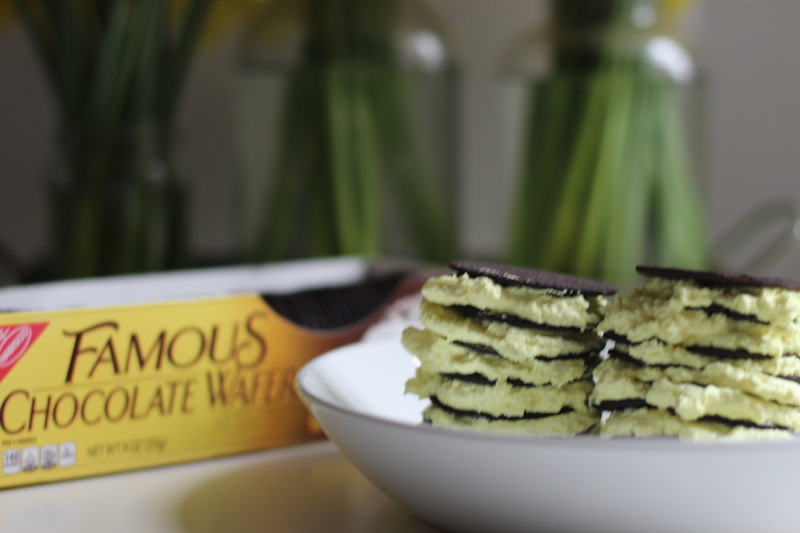 This was a two hours before the party moment… and it was a total experiment! Judging from the fact that there wasn’t any cake leftover, I will take that as a success. 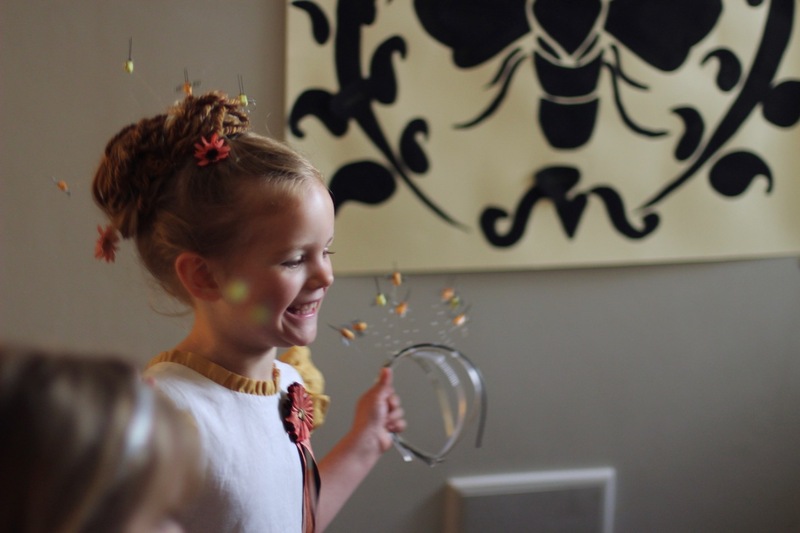 Our little ‘Baby Bee’ has always wanted a bee themed party, so she was beyond excited all day! 🙂 But we really enjoyed making it happen too! Five is such a big girl age, so an extra special day seemed right. 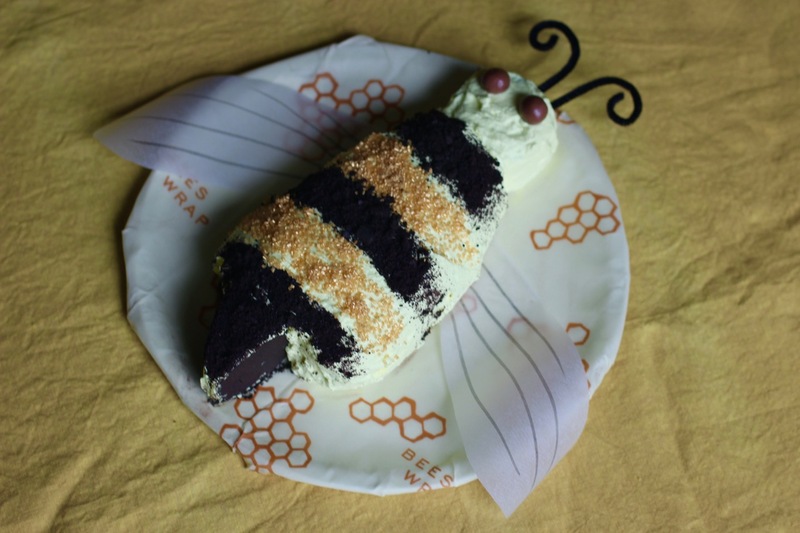 We hope you have a fun bee themed party if you try it. Please let me know! I love this! 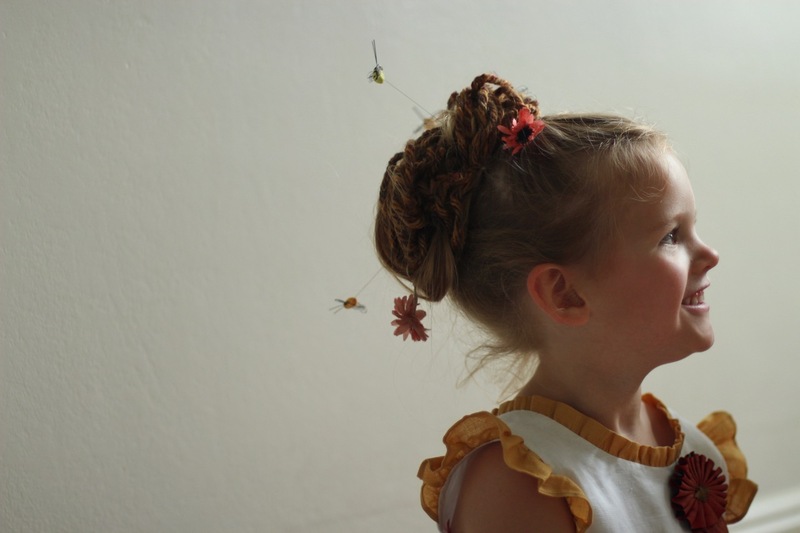 And those headbands are so perfect for my kids book, Zinnia and the Bees—a hive of honeybees magically mistakes Zinnia’s hair for a hive! What a beautiful party! 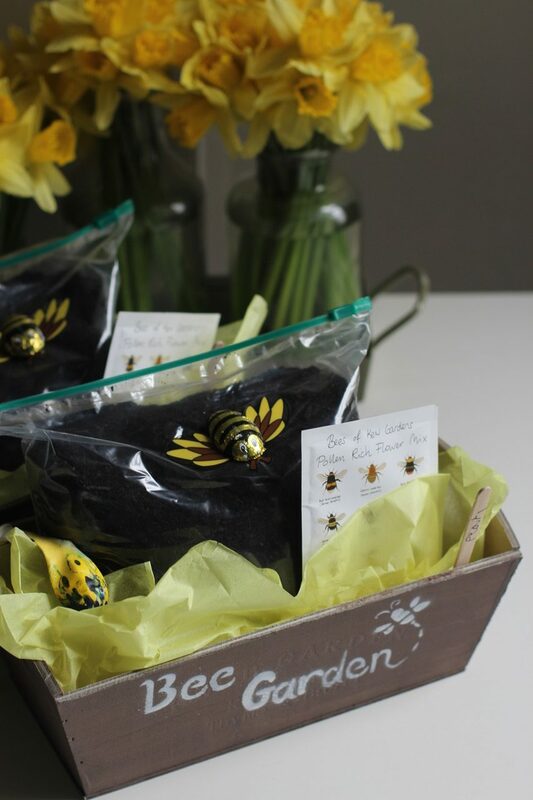 I love the party favour idea of bee friendly flowers. 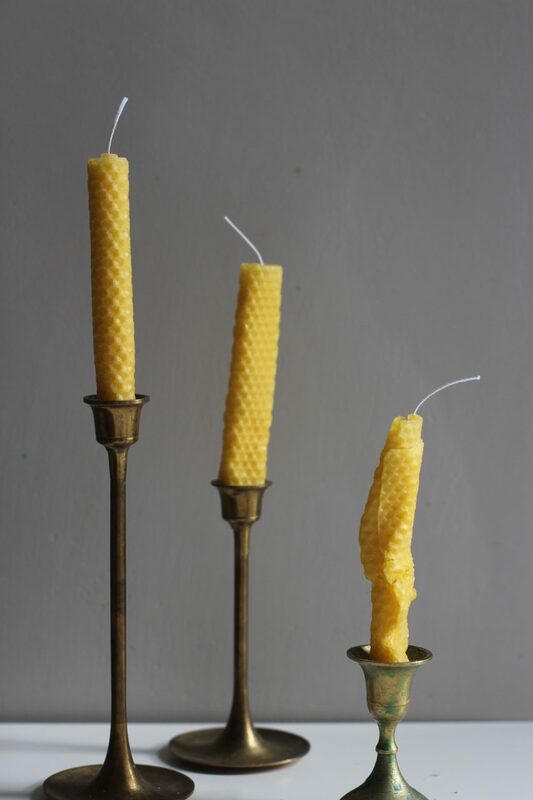 The beeswax candles are a fab idea too. The sculptural one is very cute!